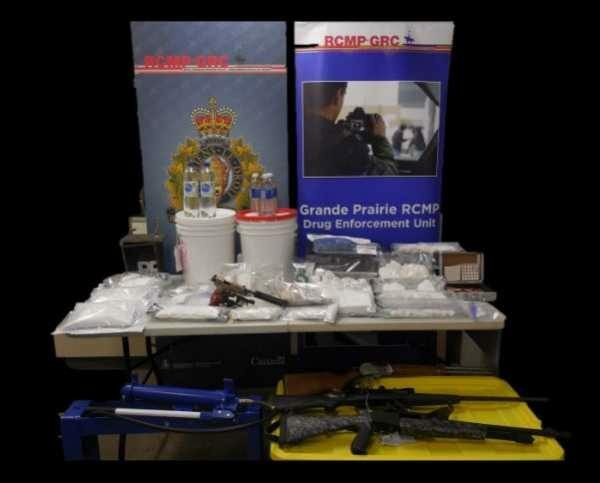 Grande Prairie, Alberta – On March 17, 2019, Grande Prairie RCMP Municipal Drug Section along with the assistance of RCMP Police Dog Services, ALERT and Grande Prairie General Duty members, executed 2 Search warrants in the City of Grande Prairie and the Town of Wembley following a drug investigation. RCMP searched both residences and located approximately $615,000 worth of illegal drugs. Canadian currency and firearms were also located during the search. RCMP searched both residences and located approximately $615,000 worth of illegal drugs. Canadian currency and firearms were also located during the search.